For the past 47 years I have trained and handled more then 14000 dogs. 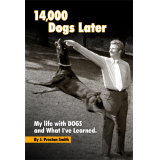 I tell that story in my latest book 14000 Dogs Later (my life with dogs and what I've learned). It is a book of real life training situations, anecdotes, and canine behavior modification. · What commands will solve 95 percent of all dog problems? · Do dogs have a soul, do all dogs bite? · What do they think about, what are the most common myths about dogs? · How do you know what dog to buy, how do you know when to let your dog go?